The style of the Café provides a friendly meeting place where those with dementia, their carers, family members and other interested parties (e.g. health and social care professionals) can come together to receive support, guidance and information in a relaxed atmosphere whilst enjoying refreshments and light lunches. 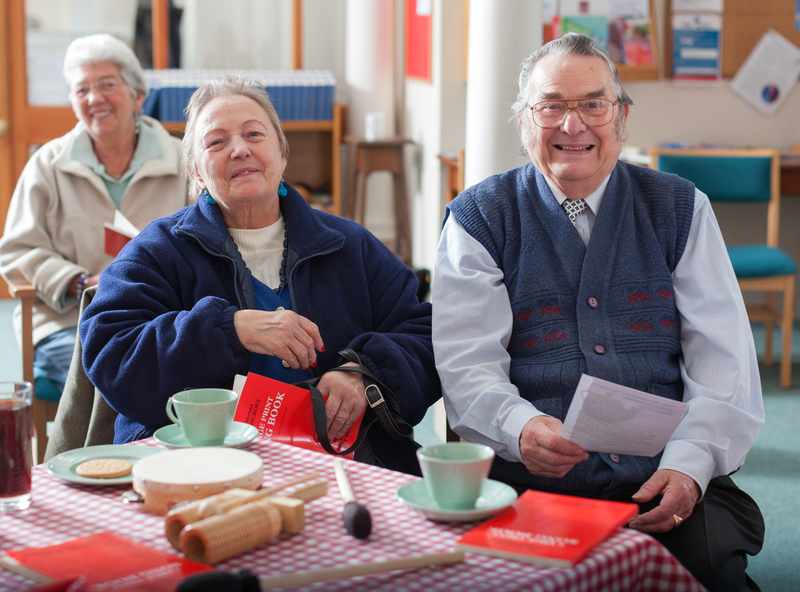 Activities include reminiscence sessions, various games, craft work and quizzes poetry and reading groups. We have two lap-top computers and provide tuition to members on access to the internet, e-mail and general computer training. When necessary we provide and facilitate advocacy for members who might be having difficulty obtaining benefits or other services. One of our most valued activities is a carers group which is held most weeks Carers meet to support each other and share experiences and help each other devise coping strategies. From time to time professionals and other experts such as Admiral Nurses may be invited to speak. During this time those with dementia are supported by our volunteers. Each Café session is under the direction of our trained Organiser who is supported by a team of volunteers all of whom are vetted, trained in dementia awareness and checked under our Safeguarding policy with the Criminal Records Bureau. Opening times 1st, 2nd, 4th & 5th Friday each month 10 a.m. to 1 p.m. The ‘Singing Café’ opens on the 3rd Friday of each month from 10 a.m. to 1 p.m.
All of our services are open access and no referral is needed, just come along and if you need help with transport we will gladly arrange for you to be picked up from your door and returned safely home after an enjoyable time at the Café. Watch the video below for more information about the Café. Wymondham Dementia Support Group from Norfolk Community Foundation. Video created by the Norfolk Community Foundation.